Pebble Epoxy Flooring | Pebble Tile | Should you use it? It’s only been 5 months, but I want to insert a brief update here. My Everstone Front Porch job is beginning to exhibit some problems. The surface is sinking on one side, revealing the cement underneath the front step. There is also some strange buckling of the pebbles around the exterior of the brick. I’ve mentioned this to my installer, but he has yet to get back to me. I will be posting an updated article with pictures, so stay tuned! Hey Bob! How are you? Just wanted to check and see how your Porch was doing. Would love to know how the Epoxy-Stone solution is panning out for you. Joe, thanks for checking in. I’m sorry to say that the porch just doesn’t look very good anymore. With all the settling and cracks, it is in need of some major repair. 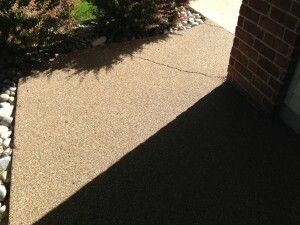 I would recommend against epoxy-stone unless you are certain you won’t have an issue with your porch settling. I am going to look into repairing it and re-staining it myself. If this looks too challenging, I may have it professionally repaired if it is reasonably priced to do so. After 1 year, I can honestly recommend Everstone Pebble Flooring 110%. The Everstone surface on my porch has held up perfectly well and still looks glossy and brand new. My only trouble had to do with the ground underneath shifting and causing the surface to sink. It had nothing to do with the material and workmanship. 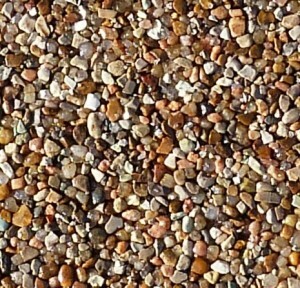 I highly recommend Everstone Pebble Flooring. Hi guys, we purchased our home with Everstone in our garage, sidewalk and small porch with steps. After three years of living here I am HATING it! Granted, we live in Upstate NY. Have put salt and what on it. The garage is as beautiful as ever. The side walk however is like walking on the beach. And don’t bother walking barefoot! It is all coming up! And it its SLIPPERY! I am searching on for a repair person to with take it all off or fix it. It is constantly in my my house! I don not recommend this product at all! We have had nothing but problems with it chipping and cracking off. It requires so much maintenance and recoat- A very poor product. Sadly, I am beginning to reach the same conclusion as you about Everstone Pebble refinishing. It is not the fault of my installer that my ground continues to settle and the Everstone is showing cracks, but I don’t like the fact that I cannot repair it myself. It was a flat slab of concrete, I could do a convenient cement repair.
. 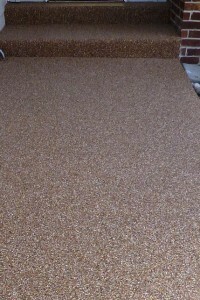 I used a pebble epoxy system on my 1,000 SF swimming pool deck. $7,000. Within two months all the shine was gone and the stone began to crack off. Distributor here in Pittsburgh said it was the sun UV rays that caused the epoxy coating to disappear. Recoating every year is the solution! Cost of ownership of this product is going to be about $600 a year in product, plus labor. Can’t get the installing company to back its warranty or even provide remediation. Not easy to find other service providers. Epoxy pebble systems are NOT practical for outdoor pool decks…. Of course, if you have no sun shining on your pool deck, you could be happy. I cannot imagine anything worse to put around a pool. Would definitely not recommend Everstone to anyone. This is the worst product ever. Installed in May 2010 and it is crumbling to the point I will have to pay someone to remove this junk. Large holes (two+ inches wide) with one inch of edges failing – don’t buy this. More and more, I’m having to agree with the critical comments on Everstone Pebble Flooring. I think my installer did a decent job and I do blame the majority of my problems on the earth settling, but the product is impossible to repair and very unsightly when it begins to crumble. It’s not worth it. Use Concrete or something else, don’t go this route. 1. problems with resin: problems based on resin are: A: yellowing, chalking and in real it means, that stones are crumbling out from your stone carpet. Solution is to use correct epoxy resin. It is error of your stone carpet contractor. Better is to use non yellowing resins. Are more expensive than non UV stable. B: Next problem with epoxy resin is: bad mixing ratio between resin and stones. When contractor wanna profit more money, give less epoxy into stones. problems based on concrete are> cracks and destruction of surface. A: High level of humudity in your concrete. If Your concrete contractor fails to comply with labor practices, result is, that Your concrete contains high rising humidity. Epoxy resin is not permeable and humidity gets under epoxy and in winter humudity freezing and destroys concrete and ctone carpet too. B: Next problem with humidity is, that concrete if there is no insulation. In this moment in winter a part of concrete goes up and in summer a part of concrete is “sitting” down. In all this cases we can see on the top of concrete cracks and next stone carpet is destroyed…..
C: and third problem with concrete is cement milk on the top of concrete. Slippery> all epoxy resins are very hardness and smoothness. The best solution is to use resins more elasticall. They are not so slippery than epoxy resin. Stone carpet is very beautiful, but we cannot apply this surface to almost any concrete surfaces. 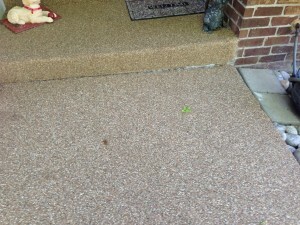 Never put stone carpet to concrete which is withouth insulation under concrete. Top of concrete must be prepared by contractor before applying stone carpet (itmeans cement milk) and the best solution all around the world is : to use dump permeable and UV stable resins. Using this one we are able to eliminate a lot of problems. In the end we can see, that a lot of problems with stone carpets are not problems with surface, but with concrete which is under stone carpet. Very interesting is, that in century, we are able to go to Mars, we are not able to do good concrete. But 4500years ago, in egypt they know this one. JUST INSTALLED EVERSTONE ON MY PATIO/PORCH.THE PROBLEM IS ONE IS COVERED AND ONE IS NOT, BUT THEY ABUT EACH OTHER.NOW THEY DON’T MATCH BECAUSE ONE IS NOW MILKY. HOW DO YOU GET OLD RESIN OFF AND START AGAIN? 1. epoxy and polyurethan resin are sensitive to humidity in time, when they cures.result is, that this resin which has been subject to moisture is milky. 2. next some epoxy resins are sensitive on high temperature. If temperature is too high, it causing, that resins softening and becomes abbot more sensitive for humidiy foe example in night, in time when they cool and solidify. how to solve problem: cut off milky part and make this one again with resin which is modified for high temperatures and low sensitivity to humidity. be carefull and cover porch when is good weather. No rain or fog. I HATE THIS PRODUCT! MY PORCHES LOOK ABSOLUTELY HORRIBLE. HOW CAN I GET THIS OFF! Did your remove this product off your porches? If so, how and at what cost in $’s, time and effort? Has anyone had hail damage to an epoxy driveway? we are fighting the insurance company because no one is familiar with the application. we had baseball size hail that damaged the driveway!